My wife and I greatly enjoyed the early French-Handel-Telemann concert last night. We were intrigued by the two-foot-long trumpets and the extra curly horns. I opined that maybe the extra pipe functioned much as today's brass mutes do, softening the sound and helping it to combine with other instruments. (But I'm willing to be proven wrong.) Your explication, please? Ensembles like Philharmonia Baroque, which play early music on period instruments (i.e. instruments like the ones used in the period in question, the 17th and 18th centuries in our case), use trumpets and horns without valves. For these "natural" instruments, the length of the instrument (that is, the length of brass tubing) determines the fundamental pitch of the instrument and, by adjusting the tension of the lips, the player can produce the notes in the harmonic overtone series of that fundamental pitch. For example, if a horn is tuned in D, that means it's a long tube of brass coiled up that's the right length to sound with the note D at a given pitch (like A-415). It's the same principle on which organ pipes are made – the pitch is determined by the length of the pipe. So if a horn is in D, it can play the notes in the harmonic series of D: D, A, D, F-sharp, A, C, D, E, F-sharp, G-sharp, A--that's probably about it. Those notes are great if you're playing in a key that uses those notes, but, if you're playing in a key that uses other notes, you need to start with a length of tube that produces a fundamental note whose harmonic series that contains the notes you need. One way of having a different length of tube (that is, a different length of horn) is to keep lots of differently-sized horns around, which is expensive and inefficient. 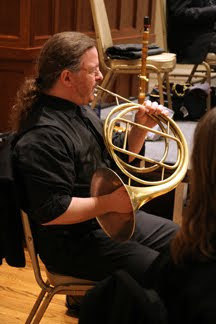 What players do is use interchangable "crooks" or removable inner sections on the horn. If you need a horn in C, for example, you need a longer tube than you would for a horn in D (since C is a whole-step lower), so you put in a crook that's exactly that much longer, and voila! your horn is in C. The notes of the C harmonic series are now available to you. You can even change keys by changing crooks in the middle of a piece (as long as the composer writes enough rests for you to remove one crook and put in another). Inventors first applied valves to the horn in 1814, yet the results still sounded “intolerable” in the 1820s to the foremost composer for the instrument, Carl Maria von Weber. In the 1830s, when Brahms was born, a Viennese inventor patented an essentially modern valve, and the Parisian composer Jacques Halévy published the first orchestral parts conceived purely for valved horns. They were to be played alongside the old and tellingly named natural horns. Such hybrid scoring continued in the 1840s, with examples from Robert Schumann and Richard Wagner. So the curlicues of tubing you saw on Philharmonia's brass instruments aren't intended to mellow the sound. You're right, in the sense, that the older, non-valved horns had a more pleasant and mellow sound than their valved descendants – that's why there was so much resistance to valves by some players and composers in the 19th century. Brahms is a prime example of a composer who much preferred the sound of natural brass to valved brass. Your explanation was spot on with the very minor quibble that depressing a valve actually lengthens the length of tubing rather than shortening it. Think of the valves as corresponding to 3 (or more) mounted crooks that give the player access to different combinations of overtones series by depressing one or more of the valves.